Fayence is located in the heart of the Camandre Valley in the Var department of Southern France. It's a small town, perched atop a hill, with over 4000 inhabitants. It is perhaps one of the most colourful towns France has to offer. The red rocks and the yellow mimosa blend ! 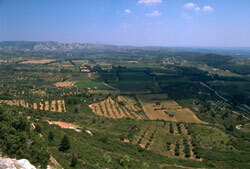 in wonderfully with the olive trees that surround the town. The main economy of the town is still based on crafts, while tourism is also the source for much of its income. Visitors to the town will be able to pick up a number of home made artefacts from wood, stone, metal, cloth or porcelain. Despite the town's size, there is plenty to do in Fayence. It is perfect for those who are after a thrilling experience and are not afraid of heights. The town caters for both gliding and hand gliding. This is a great way to take in the dynamics of Fayence and the surrounding area. If that's not your thing then don't worry. The best way to take in the peacefulness and charm of the town is still on foot. Do the people of Fayence wear watches? Fayence is a maze of steep and narrow lanes and the town has preserved its medieval atmosphere. If you follow the hill to the top then you'll find the remains of a castle that once stood here defending this fortified town. You'll also find the clock towering over the rest of the town here - there is never any excuse to be late in Fayence! There are two churches. The Church of St-Jean Baptiste was built in the 16th Century while the Parish Church was built in the 18th Century. Flying there is easy as there are regular flights into both Nice and Toulon from the UK. If you're travelling by car then you should turn off on the D562 between Draguignan and Grasse. You'll be able to see the town on the hilltop above you. Alternatively the TGV train service arrives in Marseille from Paris. Fayence is popular with tourists and so there is a thriving rental market here. This means that you'll have plenty of opportunity to make some money back on any property you buy here. It also means that the starting price is going to be very high. 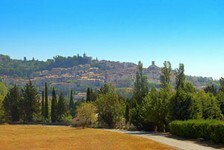 There are no 'bargain properties' around Fayence. Hi - we own a property in Fayence, Var. We have leased the property on a buy to let scheme for 10 years. At the end of March we are taking back the keys and renting the property ourselves. Could you advise on an agency who would sort out the gas, electricity, tv licence, water etc? Thank you. Thanks for contacting us, though I can only suggest you have a look at our Business Directory for agents/companies who could help with this. You could also perhaps ask your Mairie for their advice. Do you know Fayence better than we do? Do you have photos of Fayence? Located in the north east of the Var department. Access: Nice and Toulon both have regular flights to and from the UK. Marseille has a TGV station. Interesting fact: The stone used to construct the town is predominantly red, giving it an unique and colourful appearance.